Broadcasting House is an icon of the nation. The 1932 familiar art deco façade at the end of London’s Regent Street has been covered for three years as the first phase of its most substantial make-over to date nears completion. Architect Mark Hines describes how the symbolic home of the BBC is being given a new lease of life. While Myer undertook the complex design of the shell of the building and some of the key internal rooms, the really radical spaces lay within the heart of the tower itself. This contained some of the most important modern interiors in the country. For these exciting new sound proof studios, the BBC turned to some of the best young designers of the time, which included Raymond McGrath, Wells Coates and my favourite, Serge Chermayeff: by day a serious avant-garde modernist and by night a champion ball room dancer. The design of the furniture and fittings (including the rather elegant ashtrays) was co-ordinated by McGrath and other items delegated to the other designers. 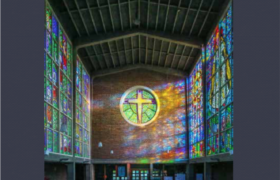 Also to be credited for this extraordinary collection of rooms is Reginald Maufe who designed the religious broadcast studio like a chapel and Dorothy Warren Trotter who designed studio 3D (for talks) in the style of a library. The studio tower originally contained no fewer than 22 studios in all, each built as a self-contained suite with its own waiting room for artists. Such a large number of studios was needed because the time taken to rehearse a programme was often more than three times that of the live performance itself. Some types of programme, such as plays, could require as many as six studios in simultaneous use. When the building opened in 1932, the Architectural Review compared it to a fortified mediaeval castle. The central donjon or keep that forms the inner core of the studio tower was surrounded by the more public spaces and service ways, like an outer ring of defences. The tower, being entirely encased by the offices, also had to be provided with artificial lighting and ventilation. This unique arrangement required a relaxation of the bye-laws requiring ventilation to the outside air. The BBC was also aware of the possibility that those whose duties kept them at work for long periods within the central tower might as a result suffer from depression. Myer’s clever solution was appropriately innovative: to introduce artificially-lit casement windows to provide the illusion of daylight within the depths of the plan. However, despite all of the clever thinking behind the design of the building, Broadcasting House could not keep pace with the rapidly changing world of broadcasting. Two incidents in particular forced the BBC to change broadcasting practice fundamentally. Firstly, the announcement that King George V was dying was immediately followed by a rather upbeat Henry Hall dance band number. A year later in 1937, Lieut.-Commander Woodrooffe’s outside broadcast from the Spithead Review could not be stopped despite the fact that he was obviously totally inebriated. So for the next 60 years Broadcasting House became a sort of experimental acoustic laboratory. The downside was that this meant that banging from almost constant construction work could often be heard on air. Sadly, almost all of the original interiors were soon replaced, either damaged during the war or ripped out due to constantly changing technical needs. As the years went by and broadcasting developed, the building would get unbearably hot from the heat generated by the new technology. Opening windows allowed traffic noise in from the busy road outside, underground trains could be heard rumbling through the building, and we were told that any more holes in the studio tower would lead to its imminent collapse. Finally the building was described in an 1985 Royal Academy exhibition as “hopelessly obsolete” and the BBC began to focus their attention on development in White City. However, by the late 1990s, the BBC decided it was time to reconsider Broadcasting House. The essential idea behind the project was to create a new home for BBC Radio and Music, BBC News, and the World Service (who will be vacating Bush House in 2009). MJP Architects have spent the last 4 years repairing and extending the building to accommodate the three directorates. This has included dealing with the dreaded “Regent Street disease” (water getting in between the steel frame and the stone) and carefully cleaning the exterior and the sculptures by Eric Gill. These are based around the figure of Ariel, invisible spirit of the air, who serves as a personification of broadcasting. The sculptures include ‘Ariel between Wisdom and Gaiety’, ‘Ariel hearing celestial music’ and the most important group in the niche above the main entrance showing Prospero, Ariel’s master, sending him out into the world. Rather than emphasising the difference between the existing and the new interventions, we have tried to create changes that are sympathetic and resonate with the character and lines of the original building. The most visible change to the exterior has been to replace the original cat-slide roof. Our four new floors reinstate Myer’s original intention of symmetry and will unite Broadcasting House with the new extension. It will also form a new backdrop for the drum and spire of All Souls’ Church. Internally, the areas which retained their original character have been identified and repaired. 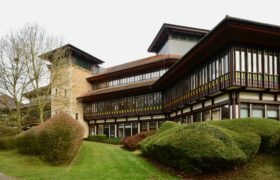 Luckily, the building had been well documented on completion and the excellent BBC archive records held at Caversham helped us track many of the subsequent changes. The principal surviving areas today consist of the Reception, Council Chamber, Artist’s Lobby and the Radio Theatre. English marble (Hopton-Wood stone) lines the walls of the repaired reception. The central feature of the Hall is a symbolic figure of ‘The Sower’ by Eric Gill. On the wall directly facing the main entrance is a Latin inscription, the translation of which is as follows: “This temple of the arts and muses is dedicated to ALMIGHTY GOD by the first Governors of Broadcasting in the year 1931, Sir John Reith being Director-General. It is their prayer that good seed sown may bring forth a good harvest, that all things hostile to peace or purity may be banished from this house, and that the people, inclining their ear to whatsoever things are beautiful and honest and of good report, may tread the path of wisdom and uprightness.” We have designed a new reception desk and security screen to complement the original finishes and it will continue to be used as a principal entrance to the building. The Council Chamber is sixty feet across and is lined with Tasmanian oak. The room’s acoustic qualities were said to be “strangely happy” to the naked ear and at night, the space was entirely illuminated by reflected light from lamps concealed in wrought-oak urns. We have carefully cleaned the oak panelling, added new light fittings and concealed all of the new technology. This was originally a separate lobby for performers to access the studios. We have retained the sparse character of the space and added a new backlit white glass screen to illuminate the area. Unlike most concert halls, the audience accommodation was seen as secondary and most of the floor space was taken up by the orchestra. The repaired theatre will be more audience focussed, provide better audience facilities and improved access. The strongly marked piers and beams of the interior express the fact that the theatre is situated in the heart of the building, with the immense weight of the studios above. The walls are decorated with a series of bas reliefs by Gilbert Bayes which have been gently cleaned. The bronze organ grille over the platform will remain the main point of focus in the room. A new floor has been inserted (replacing a 1994 false floor) to allow direct access from street level, and do away with the need for lifts. A new oak-clad cubicle under the original gallery will house state of the art broadcast equipment and allow more use of the theatre for live broadcasts. The importance of the BBC to the nation as a public institution is perhaps best summarised in the words of the Architectural Review that was devoted to the building when it opened in August 1932. This declared Broadcasting House to be a ‘New Tower of London, a focal point and a trade mark for broadcasting, something more than a mere block of offices enclosing a sound factory; like the Tower of London itself, it becomes a national monument’. It is true that the undertaking of the repairs has certainly challenged us but the project has enabled us to bring high performing broadcast studios and offices back to the home of the BBC. The viability of Broadcasting House has always been linked to the pace of technological change but now at last the building is truly resilient. This great battleship at the end of Regent Street should sail through the uncertain waters of broadcasting well into the 21st Century.